Whether you’re looking to improve the quality of sleep you get each night or you’re looking for the perfect pair of pillows for a guest room, we’ve got you covered with a killer deal you don’t want to miss. 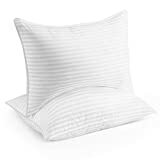 The Beckham Hotel Collection Gel Pillow is the best-selling pillow on Amazon, with more than 3,300 5-star reviews and a coveted “Amazon’s Choice” designation. This awesome pillow is also on sale right now at a discount, so you’ll only pay $32.99 for a 2-pack!